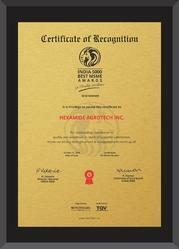 We, Hexamide Agrotech Incorporation, started in the years 1999, are one of the foremost manufacturers and exporters an extensive array of Chemical Plant, Machineries & Equipment. 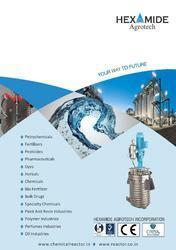 Our offered range consists of best grade Chemical Reactors, Chemical Vessel and Chemical Blenders. To manufacturing these products, we use quality tested components and modern machines. Our products are appreciated for their compact design, excellent accuracy, reliable performance, sturdy construction, durability and low maintenance. Our robust and cutting-edge infrastructure is established over a wide area of land. This facility is outfitted with modern machines, which are used for all our operational processes. 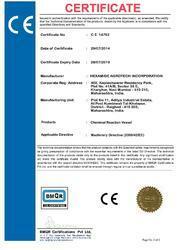 Our quality controller team check the product line on various quality tested parameters. Hence, we have been successful in maintaining the trust and confidence of our patrons. Also, our employees devotedly work towards making clients' specific products. The atmosphere at our organization is properly coordinated, which aids in designing and developing flawless range of products. In addition to this, we export our products in South Asian, African Union and the European Union. Our mentor, Mr. Ajay Jadhav Patil, has guided us to be able to famous in this domain. Our zeal has enabled us to carve a niche in this industry. Manufacturing of Chemical Reactors, Jacketed Reactors, Agitators Blending machine, Industrial Mixers, Pressure Vessels, Process Vessels, Distillation Units. We are felicitated for Quality Excellence with "INDIA 5000 BEST MSME AWARDS 2018"
Clients effective value added services which play a vital role in business as the initial purchase. We at Hexamide Agro Tec, Inc. have emerged as one of the renowned supplier & retailers of used chemical equipment & machinery with a rich industrial experience of 18 years. We take utmost care while dealing with a client and ensure their demands are met in best possible manner. From machine installation to modification, erection, and commissioning, up to after sales services everything come under our services. We have employed toughened professionals in industrial maintenance. To meet the client requirement we even design the layout of the equipment keeping in mind heat load material balance and energy balance of the product, resulting in low production and utility cost. With an ethical business practice and customer-oriented business approach, we have created a remarkable position in the market. Further, out timely delivery service and after sales maintenance support help us in gaining the most leading position in the industry. Besides, we maintain a healthy and cordial relationship with our customers as well as vendors to keep the smooth flow of business. Our team of highly experienced and qualified professionals assists us in manufacturing and exporting a wide range of chemical plant, machinery & equipment. These professionals maintain the effective communication link and work in close coordination with each other. 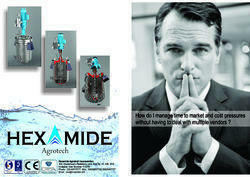 This helps us in accomplishing the common objectives of the firm within predetermined time frame. In addition to this, our professionals also attend regular seminars, which help them in enhancing their skills and making them aware of the latest product development and market trends. With an ethical business practice and customer-oriented business approach, we have created a remarkable position in the market. To ensure the presence of these features in our offered array, we make use of the high in a class raw material. Our company takes pride in providing the chemical plant, machinery & equipment of superior quality at very affordable rates. Besides, we maintain a healthy and cordial relationship with our customers as well as vendors to keep the smooth flow of business.